The Raiders played their final game at the Bess Activity Center on Tuesday and ended 36 years of Three Rivers games in the BAC with a double-digit win. 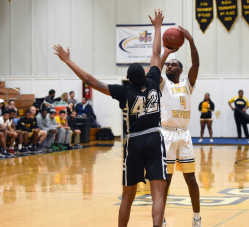 The nerves showed in the beginning, but once they got settled, the Raiders started to take care of business and put away Nationwide Academy for a 95-74 win, snapping a five-game losing streak. With the win, the Raiders finished their time in the Bess Activity Center with a 432-75 record. "I'm just glad we played hard," said Three Rivers coach Gene Bess, who earned his 1,277th career win Tuesday. "We looked like some of the old Raiders teams tonight. We fought back and we played hard. It was a good way to finish this thing off." After a slow start in which they trailed by five points early and missed a slew of free throws, the Raiders regrouped and led by two early in the second half. After that point, they rattled off a 23-4 run to take a 20-point lead. Tristan Jarrett finished the game with 35 points, 10 rebounds, four assists and three steals as he stayed on pace to have the best scoring season in Three Rivers history with his 11th 30-point game of the season and his ninth double-double of the year. Tallon Fonda also tallied a double-double with 13 points and 11 rebounds. Jarrett scored eight of the first 10 points on the game-clinching run with two 3-pointers and a drive to the basket and finish through a contest from the defense. Abiodun Ayetimiyi stole the ball and took it coast-to-coast for an easy layup. Miganeh Jama followed up his layup with a triple in the corner to put the Raiders ahead by 16. "We told ourselves we've been losing, and we don't want to have the losing record, like losing the last game, so we talked to ourselves like, 'Hey, today we just have to come out and play as a team and put in all the effort we need to make sure we win the game,'" Ayetimiyi said. 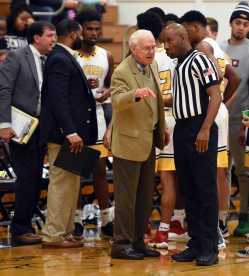 Three Rivers coach Gene Bess, left, talks to a referee during a timeout of a game against Nationwide Academy on Tuesday, Jan. 29, 2019, at Three Rivers. With the win, Three Rivers avoided becoming the first team to lose eight games in a season in the BAC. Three Rivers went up by 20 points for the first time in the game when Hayden Sprenkel stole an outlet pass, dribbled up the court and buried a pull-up 3. The Bengals trimmed the lead down to 13 points with a couple of spurts, but the Raiders never let them pull within 10 points. After falling behind 7-2 after a string of five straight missed free throws, the Raiders composed themselves and went on a 20-5 run to follow. Fonda started the run the first three points after knocking down a free throw and finishing off a putback. "We took a little while to adapt, and we've got a fairly inexperienced team," Bess said. "I'm hoping a game like this is going to help them in the future because we've had good spurts over the year. What we have to do is play through the down times, so we did that much better tonight." Consecutive 3s from Jarrett and Hayden Sprenkel gave the Raiders the lead after their shaky start. After a layup from Ayetimiyi, Fonda one-upped his prior putback with a two-handed putback on a missed layup. Sprenkel finished the run with a layup after Fonda found him when he leaked out in transition. Three Rivers' Tristan Jarrett (4) takes a shot as Nationwide Academy's Christian Choice defends during the first half on Tuesday, Jan. 29, 2019, at the Bess Activity Center. "I would say we're expecting a lot from ourselves, so we were nervous because no one likes to make a mistake. We just want to do the right stuff," Ayetimiyi said. "Later on, we just calmed down, talked to each other and made ourselves understand like, it's the same game, we just have to make the effort to get the turnaround." Christian Choice broke the run with a 3-pointer after catching a skip pass, but the Raiders didn't relent. Three Rivers finished the game with a plus-13 rebounding margin, a huge bounce-back game after it was out-rebounded by 31 last time out against Moberly Area. The ball movement by the Raiders Tuesday was solid, too. They tallied 22 assists. "I think we have to feel good that we were able to compete on the boards with them. We kept them to one shot quite a few times, which is what good rebounding can do for you," Bess said. "… But the difference was we got some second shots and some third shots. That definitely helps the 3-point shooting." Ayetimiyi caught a tipped pass and took it coast-to-coast for a layup to give the hosts their first double-digit lead of the night before they gave the Bess Activity Center a proper send-off. Next up for Three Rivers, they'll move into the Libla Family Sports Complex for their alumni reunion Saturday, finishing the day with a game at 7 p.m. against State Fair.